On arrival at Melbourne Airport, you will be transferred to your hotel (flights anytime). The rest of the day is at leisure. 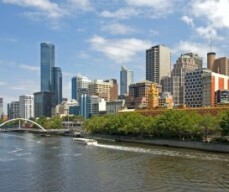 Our morning Melbourne tour is a great introduction to our beautiful city. Head NE of the city and tour through 'Little Italy' with its plethora of restaurants and boutique shops. See the exquisite architecture of Melbourne University and Royal Exhibition Building before making a brief photo stop at St Patrick's Cathedral. Spend time at Fitzroy Gardens. A favourite part of the tour? - a guided walk through some of Melbourne's best arcades and laneways with the chance to enjoy the atmosphere and have a coffee break (own expense). Our unique Melbourne tour is a showcase of Melbourne's charm. Enjoy a gourmet boxed lunch as you cruise the Yarra River taking in the sights of the city from a different perspective. Our coach tour will then show you a side of Melbourne that will give you a better insight into our way of life visiting the Botanic Gardens, Acland Street in St Kilda and Brighton Beach bathing boxes. Complete your day with an unforgettable experience of dining in a 1927 Colonial Tramcar Restaurant where a sumptuous three-course dinner with beverages is served. Then you will join Early evening you’ll board the Colonial Tramcar Restaurant, for what is not only a culinary delight but a trip into a little piece of Victoria’s history. As you cruise the city streets of Melbourne, you’ll enjoy a seasonal menu and quality Australian wines. The trams have been carefully refurbished to provide all the modern conveniences you would expect from a first class restaurant; comforts such as seats covered in plush velvet, beautiful brass fittings to cast a cozy glow and background music to add to your dining experience. Drive through the beautiful Dandenong Ranges and take a break to enjoy Devonshire Tea at Grants on Sherbrooke. You can hand-feed Australian birds such as the Crimson Rosella, Cockatoo and Galah. Next stop is Belgrave, to board the Puffing Billy Steam Train for a journey back in time through the heart of the rainforest. You’ll head through gorgeous Sherbrooke Forest and ride over the old Trestle Bridge. Just before Menzies Creek, you can see stunning views of Port Phillip Bay. The scenery en route to the Yarra Valley is just spectacular with the Great Dividing Range as the backdrop. When you arrive in Victoria’s premium wine growing region, you’ll visit Rochford Winery for lunch. Enjoy a delicious two-course lunch overlooking sculptured lawns and vineyards and sip on a glass of one of their top blends. Later you may visit estates such as Dominique Portet or other local wineries to taste their selection of Australian wine. Your short break concludes this morning after breakfast. You'll be transferred to Melbourne Airport for your onward flight (flights anytime). The above prices are the starting prices and only applicable during off seasons. Surcharges are applied for travel between 1/12 to 28/2, during any festival (like Chinese New Year etc), cruise arrival time and on School and Public Holidays in Australia due to the increase in accommodation cost. So contact us on bookings@lokshatours.com before you book to get the right price.